Why you should pursue a career in Appium framework testing? 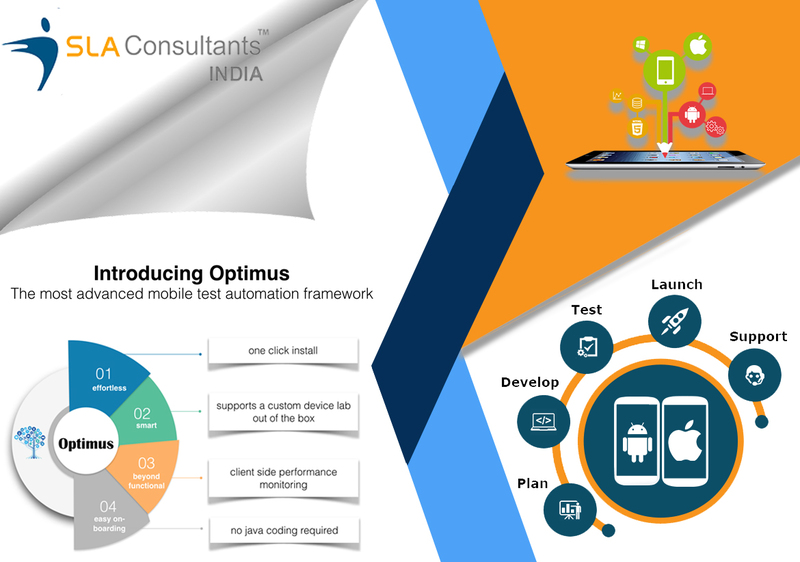 Appium is an open source Automation Testing tool which is used to develop mobile applications. It helps the user in testing three different types of mobile applications – native, hybrid and mobile web. Today, many mobile application development companies are using Appium Framework for testing their programs and this is the main reason the market is filled with opportunities for Appium testers. Many IT students are pursuing careers in software testing and learning Appium Framework testing. If you are also willing to make a career as a software tester then it is highly important that you attend equality Appium testing training course from a reputed training institute. SLA Consultants India is a leading Training Institute located in Delhi NCR which offers one of the most reliable and job oriented mobile app testing training course to Aspiring candidates. Why is Appium testing important in today’s market? Appium is completely free and open source framework which makes it very desirable and extensively used around the world. It is specifically designed and focus on development and testing of mobile applications, unlike any other framework. It is an Automation Testing tool that helps the user to perform testing on mobile applications without learning any developing skills. The framework can test native, hybrid and mobile web applications which can easily be tested on a mobile device or simulator. Developing test scripts using Appium libraries are quite easy. It helps in developing or testing mobile applications for Android and iOS. Appium also supports various Internet browsers suggest Safari, Chrome and inbuilt Browser for Android. Should not recompile your application to automate. Shouldn’t be locked into a particular Framework or language. It should be an open source. And when it comes to automation APIs it should not reinvent the wheel. During the past few years, the number of smartphone users has increased dramatically, and thus, companies are now targeting smartphone users to enhance their sales and revenue, for which, they require sales oriented and flexible mobile applications. By using Appium testing application development, agencies can provide business companies with the right tool that would help them better interact with their potential customers. Since most of the smartphone users belong in the category of Android and IOS, Appium Framework testing is considered the most groundbreaking and significant way of ensuring that the developed mobile application is worthy and meet all the requirements of the client. All this tells the huge scope of Appium testing in the current business market and how it is growing on a daily basis. If you are willing to learn Appium testing and take advantage of this incredible field, then it is highly important for you to quickly join well-recognized training agency who would help you gain all the knowledge and skills regarding the testing framework. SLA Consultants India is well known to provide the best software testing training course in Delhi, Gurgaon, and Noida and targets college students who are either graduated in IT field or in their last year of college. The advance and industry oriented training course would also benefit working professionals who want to enhance their expertise further. At SLA Consultants India the learners will receive in-depth comprehension on Appium framework and automation testing provided by highly experienced and certified trainers. We have industry focused and updated course material along with workshops and handouts to help the learners get a clear idea of Appium testing. Projects and assignments are given to test the learnings of the candidates and in the end, 100% job placement assistance and interview preparation are provided to make sure the applicants are placed at a reputed firm as an Appium tester. To know more about the mobile app testing training course or the institute, please give us a visit at our office in Gurgaon, Noida or Delhi.